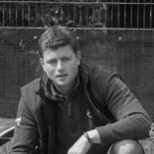 Anthony specialises in Dog Agility and as well as winning numerous national and international championships himself, also coaches the British teams. He’s equally as good at getting dogs to calm down as opposed to leap over, and despite his tender years has over 16 years experience in training dogs – and their owners! He lives near Cirencester with partner Holly, chatelaine of Mead House, House of Mutt’s Training Wing.